If you're anything like me, you avoid most Asian food except for P.F. Chang's, which has an extensive gluten free menu. I don't avoid it because I dislike it; I used to be a very picky eater and not eat anything other than pasta with butter. The irony is clear -- I can no longer go to any restaurant and order pasta. Nor can we Celiacs (or people who keep a gluten free diet) imbibe in soy sauce-laden Asian food because of wheat's use as a thickener in soy sauce. Well, San-J to the rescue! 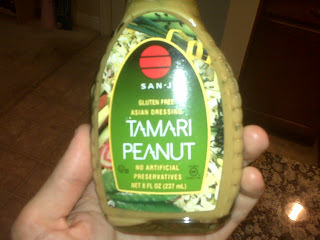 I've been using San-J's Wheat-Free Soy Sauce for a long time but didn't know that San-J made other gluten free. I was recently over at my friend Lauren's apartment while her roommate, Vanessa, was making dinner with her boyfriend. Vanessa randomly looked at the salad dressing bottle they planned to use and saw that it was marked "Gluten Free." Forgive me that the quality isn't the best as it was taken on my camera phone. Regardless, it's good to see San-J making more gluten free products! I tasted a bit of the sauce and it was great, particularly after staying away from peanut sauce for so long because it often contains gluten. After a quick look at San-J's website, it looks like the company makes two additional gluten free dressings: Sesame and Ginger. All of the company's cooking sauces are gluten free too! The company's website even has a great recipe listing, in which you can choose the product you want the recipe to be based on. Watch out for gluten in the added ingredients, of course, and make changes accordingly.